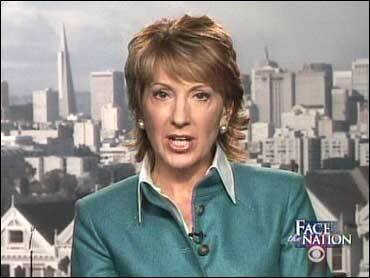 Republican California Senate candidate and former Hewlett-Packard chief executive Carly Fiorina today announced that she had secured the backing of former Republican vice presidential candidate and Alaska governor and current television personality Sarah Palin. "Carly is the Commonsense Conservative that California needs and our country could sure use in these trying times," Palin said in a release. "She's not a career politician. She's a businesswoman who has run a major corporation." "I'm a huge proponent of contested primaries, so I'm glad to see the contest in California's GOP, but I support Carly as she fights through a tough primary against a liberal member of the GOP who seems to bear almost no difference to Boxer, one of the most leftwing members of the Senate," Palin added. Palin also trumpeted the endorsement on her Facebook page, where she called Fiorina "pro-life, pro-traditional marriage, pro-military, and pro-strict border security and against amnesty." "Carly is the only conservative in the race who can beat Barbara Boxer," she wrote, in a possible explanation for why she isn't backing DeVore. "That's no RINO. That's a winner." Fiorina was an adviser to the John McCain/Palin 2008 GOP presidential ticket, and she said she is "honored and grateful" for Palin's support. "She, too, is a political outsider and a strong fiscal conservative, and we share a common concern for the direction our country is headed in under Barbara Boxer and her allies in Washington," Fiorina said in a statement. The Associated Press reports that Campbell cast the endorsement as settling "the IOU from the 2008 election cycle." Palin and Fiorina seem somewhat odd bedfellows, particularly as Fiorina is expected to campaign as a relative moderate if she gets through the primary and gets to the general election in liberal-leaning California. The primary will be held on June 8th, and most polls show Campbell currently leading second-place Fiorina.